When flooding occurs, our first concern is the inside of our home — but what about the outside? Next time you suspect a leak, try checking these common flooding areas. The outside of your home has many possible sources for home flooding, so it’s important to check the exterior on a regular basis. A good place to start is with the water meter. Turn off every faucet in your home, inside and out, including the sprinkler system. The meter shouldn’t be moving at all. If it is moving, there’s a good chance there’s a leak, or a malfunctioning meter. Either way, you should immediately look into it further. If the meter is fine, check the main shutoff value, which is usually in front of the house by the street. Make sure there are no leaks there. Next, walk around the house and check each faucet to make sure it closes properly. A leaking hose faucet lets more water into the basement than you might imagine. Inspect and clean your gutters on a regular basis. Rain gutters that are clogged with leaves and other debris don’t allow rainwater to flow freely away from the home and the basement may begin to resemble an indoor pool. If they’re cleaned regularly, the debris won’t have a chance to build up or take root. Consider installing gutter guards over the top of gutters after they’ve been cleaned. Some debris will still get inside the guards and need to be removed, but not nearly as often. If you have a sprinkler system, check the sprinkler heads regularly and replace as necessary. Damaged or worn sprinkler heads don’t irrigate evenly, leaving some parts of the lawn flooded and others areas dry. That flooding can easily end up in your home. 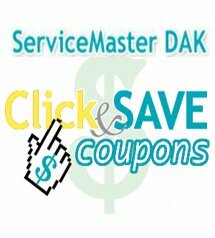 If you have flood damage, call the professionals at ServiceMaster DAK. We offer expert water damage restoration services to residential and commercial clients in Buffalo Grove, IL, North Shore, North, and Northwest Chicago suburbs. With over 40 years’ experience, we know how to quickly contain the damage, remove excess water and moisture and begin the drying and restoration process. The cost to repair flood damage varies widely, depending on how much of the home was affected and for how long.